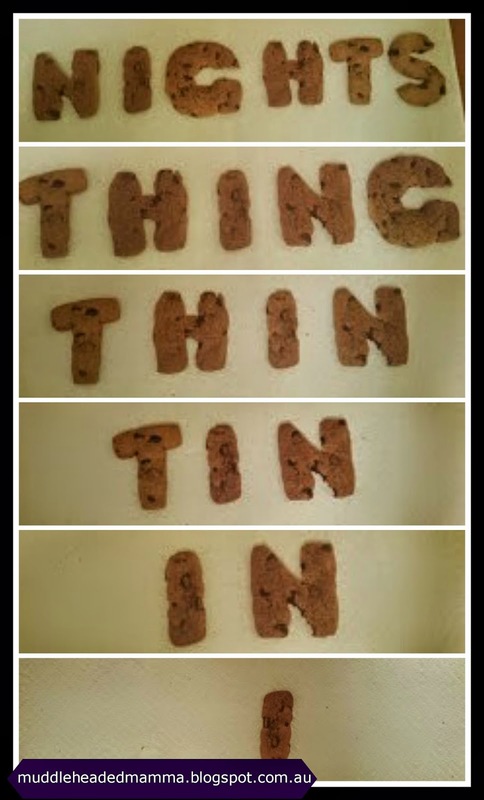 I have often wished I could eat my words and last night I did just that ... with the help of my son and some cookie dough. 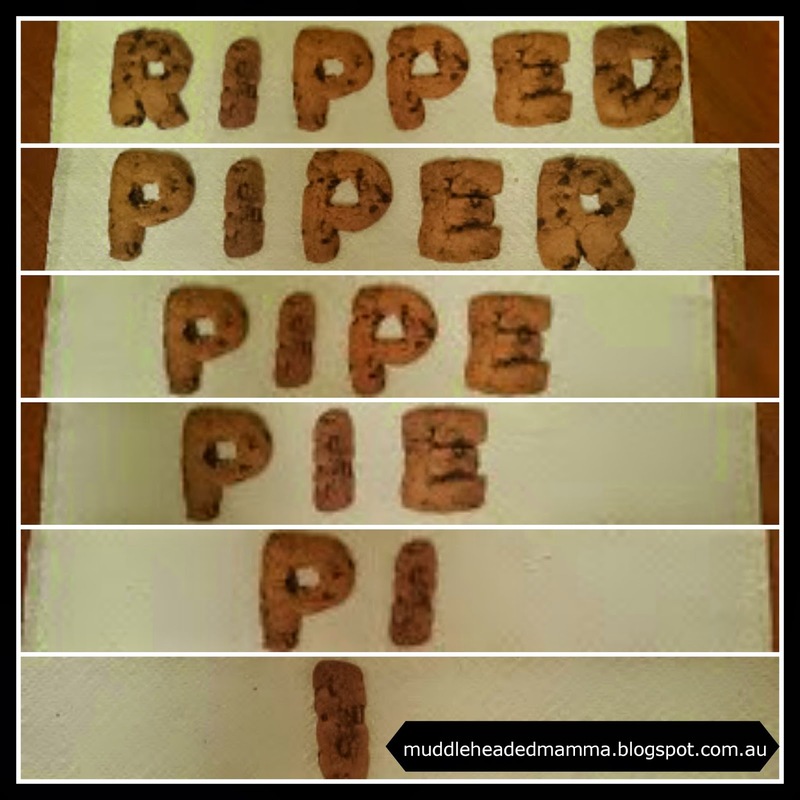 We've always loved playing word games together and after owning a set of alphabet cookie cutters for the last six years and never even taking them out of the box, I decided the time had come to put them to good use and make up an edible word game. While Ben was at school yesterday, I got out a pen and paper and, through trial and error, came up with nine special six-letter words. What's special about these words is that you can take one letter out of the original six, rearrange them and they will form a new word. 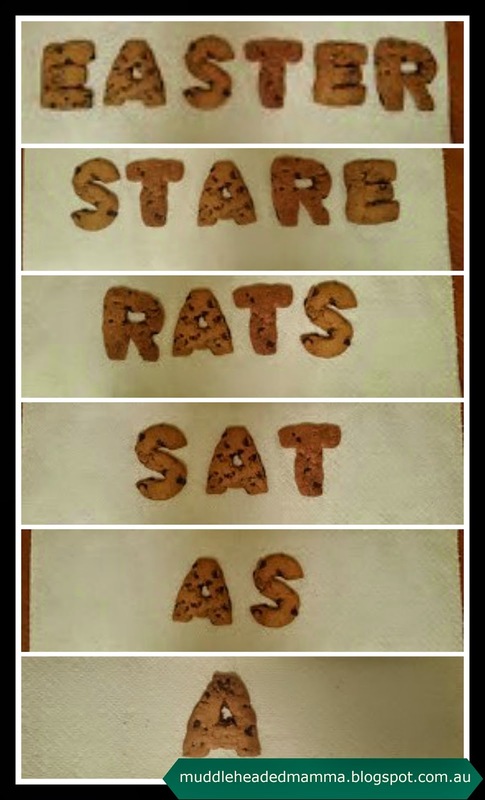 Then you take a letter out of the remaining five, rearrange them and they form another new word, and so on until you are left with a single letter word (I or A). 1. After deciding which player is going to go first, that player looks at the six letter word in front of them and works out which letter they can take out so that the remaining five letters form a word. 2. The player then eats the letter s/he has taken out and it becomes the next player's turn. 3. Players can rearrange the remaining letters if they need to but do not have to if it is not necessary. 5. All words used must be words you would find in an English dictionary. 6. All players must remember to chew with their mouths closed. 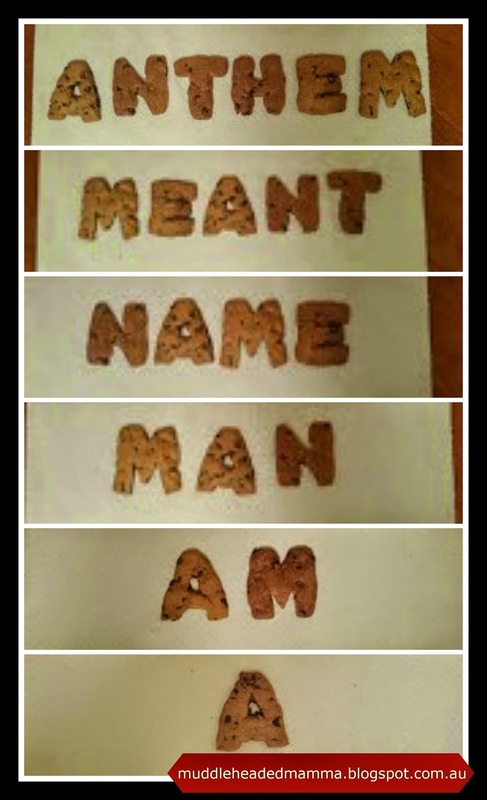 When he got home from school, we made the cookie dough and cut it into the letters we needed (I didn't show him the process from getting from the six-letter words to the one-letters words, I just let him know each of the six letter words so he'd know which letters to cut out). 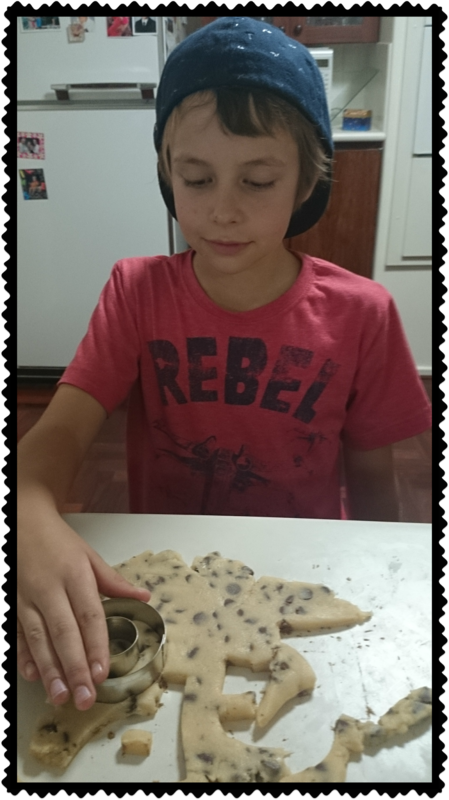 I made him wait until after dinner before we played and by then he was just about jumping out of his skin with excitement, his competitive spirit being just as much to blame for that as his anticipation of eating large quantities of choc chip cookies. 1. Each round gets easier and faster as you go along. That means you have to eat faster too. 2. I got so caught up in the excitement of preparing to play that I didn't really think about the fact that for two people to play nine rounds would mean eating 27 cookies each. We didn't actually end up eating 27 cookies each. But we gave it a good shot. 3. There are word possibilities other than the ones we used. For instance, rats could also be star, mane could also be name, cane could also be acne, eat could also be tea, team could also be meat or mate, darn could also be rand, dance could also be caned and stare could also be tears. 4. Likewise, there are also other possible word patterns for some of the rounds. The round that went master, steam, team, eat, at, a could also have gone master, steam, seam, sea, as, a; the round that went Easter, stare, rats, sat. at. 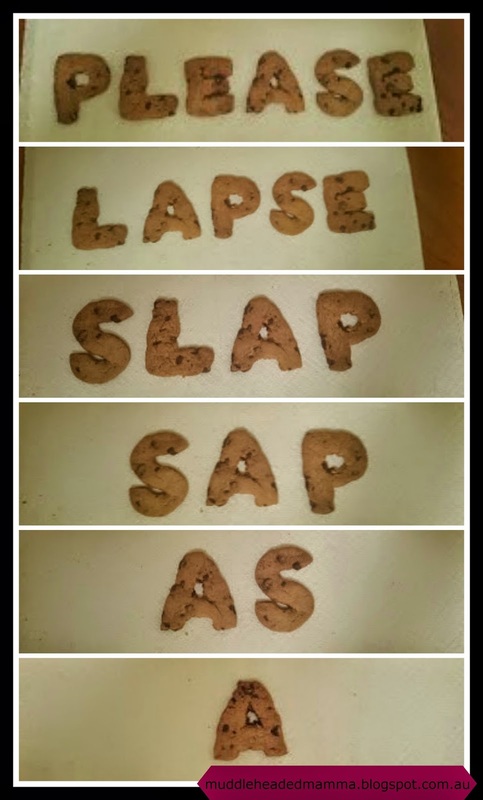 a could alos have gone Easter, tears, star, tar, at, a and the round that went please, lapse, slap, sap, as a could also have gone please, lease, ease, sea, as, a. 5. It is possible to put a spanner in the works and muck up a round by thinking you are on the right track then coming to a point where you can't go any further. For example, if you went from garden to grade instead of grand, you could then move onto dare and then are, but then you wouldn't be able to go any further. To try and avoid this, I went first in each round to move the game in the right direction. If I ever play with this with an adult one day rather than a child, I am going to write into the rules a suitable punishment for any person responsible for destroying the game. 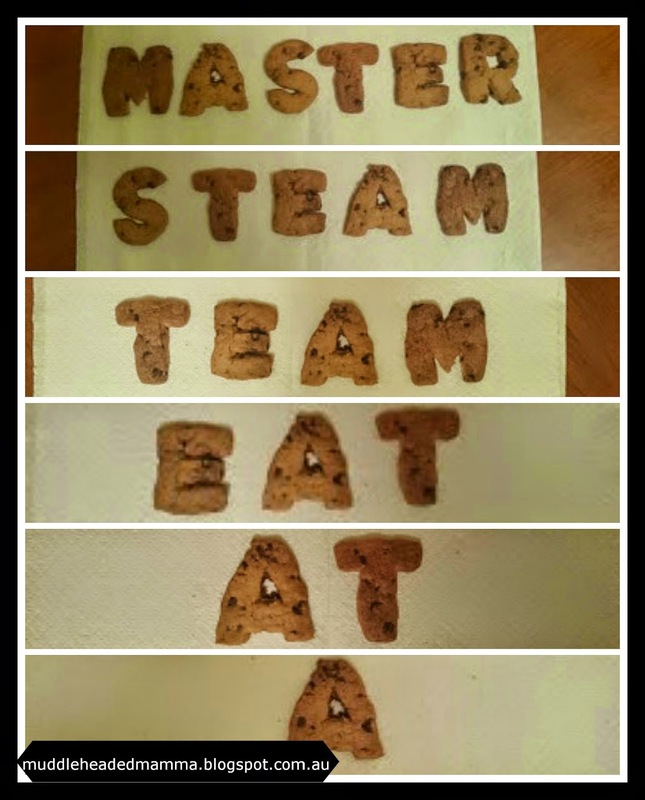 Assuming they had already gobbled up the wrong letters and the original word can't be reconstructed, they should be forced to forfeit all remaining cookies on the table to the other player. And considering that I would have thought up the words and their solutions before the start of play (leaving the other player at a distinct disadvantage), I think this rule will work considerably well in my favour! Do you have a favourite word game? 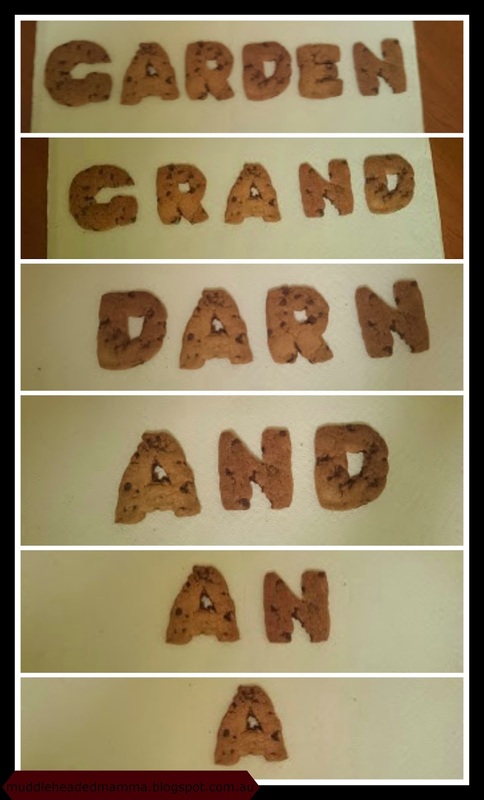 Could you make an edible version of it? 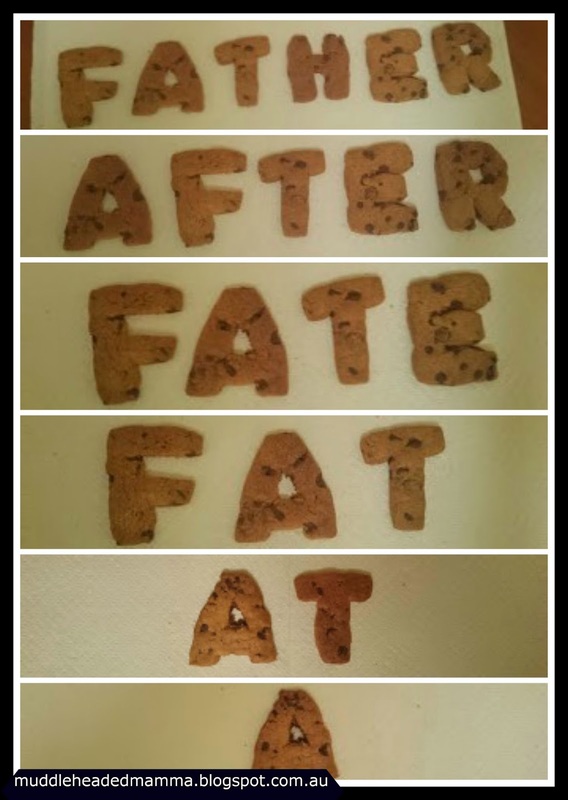 Could you eat 27 cookies in one sitting? 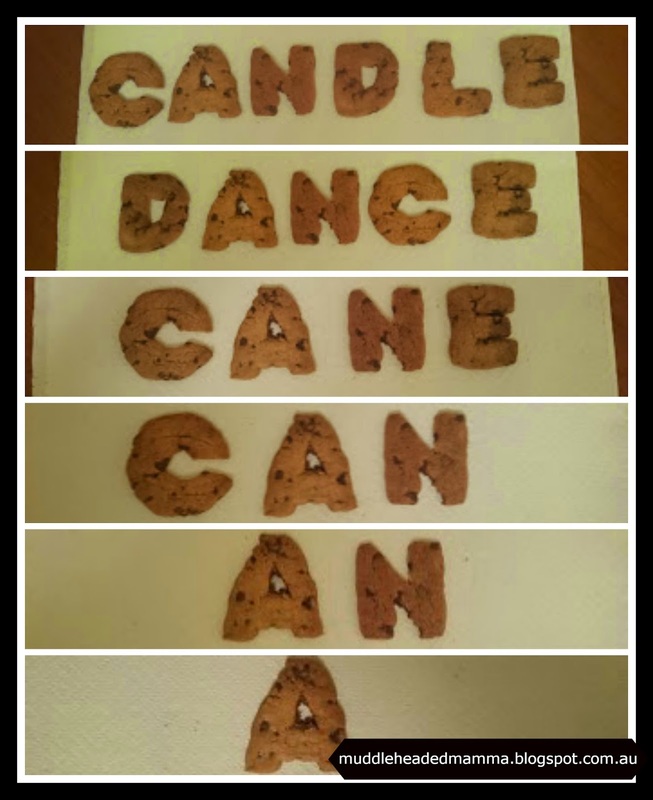 Do you know any other special six-letters words you could send my way?